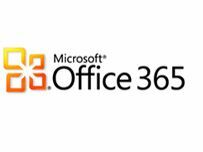 Microsoft's cloud-based Office 365 service is set to land on 28 June having been in beta since October 2010. A tweet from Jon Roskill, a corporate VP at Microsoft, confirms the date and reveals that over 100,000 customers are already using the beta service. The cloud-based Office 365 is intended for businesses, allowing people to use the suite of Office and business productivity programmes from within their browsers instead of installing a multitude of software apps on each of their machines. As Microsoft puts it, "With Office 365, your local bakery can get enterprise-calibre software and services for the first time, while a multinational pharmaceutical company can reduce costs and more easily stay current with the latest innovations." Quite why our local bakery would need enterprise-level administrative applications is not something that it goes on to clarify. With this handy cloud-ability comes a price tag, although it's not clear exactly what that is. It's bound to be more than Google's Cloud Connect service which allows Windows users to sync offline Office docs with a Google account online, though. Microsoft will release two versions of Office 365 on 28 June – one for smaller businesses and another for larger ones. The beta version of Office 365 includes Lync, Microsoft's video and communications client; it's unlikely that this will be replaced by Microsoft's shiny new toy Skype just yet.